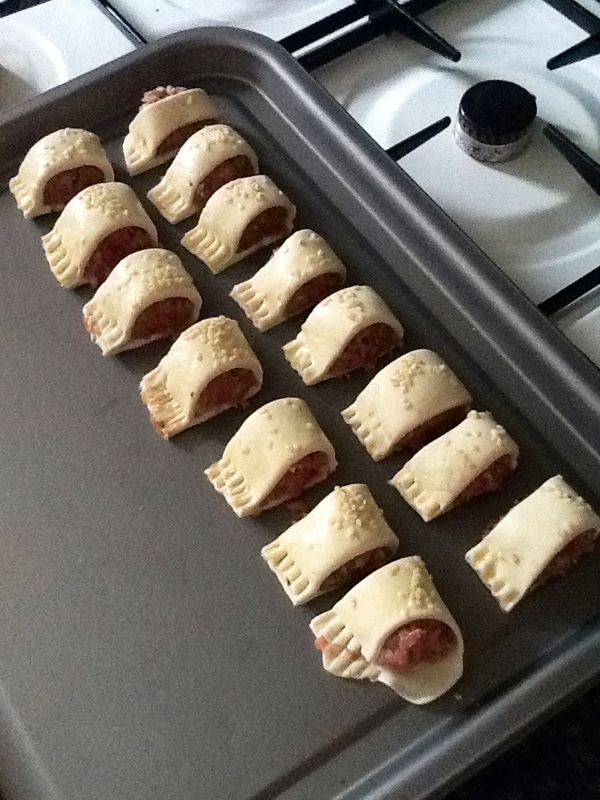 Sausage rolls are a British staple. I didn’t even know they existed before moving over here and I must say that the supermarket version, cold as ice and like papier mâché in your mouth, did not make me believe I had been missing out on anything very special. Enter Jamie Oliver. Yes, the man’s done it again. In his 30 Minute Meals cookbook he has a recipe for homemade sausage rolls, and since discovering it I have never looked back. I have made them with everything: beef sausage, pork sausage, cheap sausage, expensive sausage, and now: minced turkey. The minced turkey came about because my husband and I were browsing the sausage section of the supermarket in complete bewilderment – not only did the majority of the sausages look distinctly unappealing, but they were filled with ingredients we couldn’t pronounce and most of them were less than 75% pork. I didn’t want to spend a fortune on sausage just to wrap it in pastry and have it wolfed down by the five greedy boys who were coming over to watch football later that day, so the more economically priced mince turkey was thrown into the cart and the experiment began. Basically, I treated it as if I was making a burger mix. I added a quarter of an onion, grated, a teaspoon of Dijon mustard, a teaspoon of Worcestershire sauce and a sprinkling of dried parsley, salt and pepper. 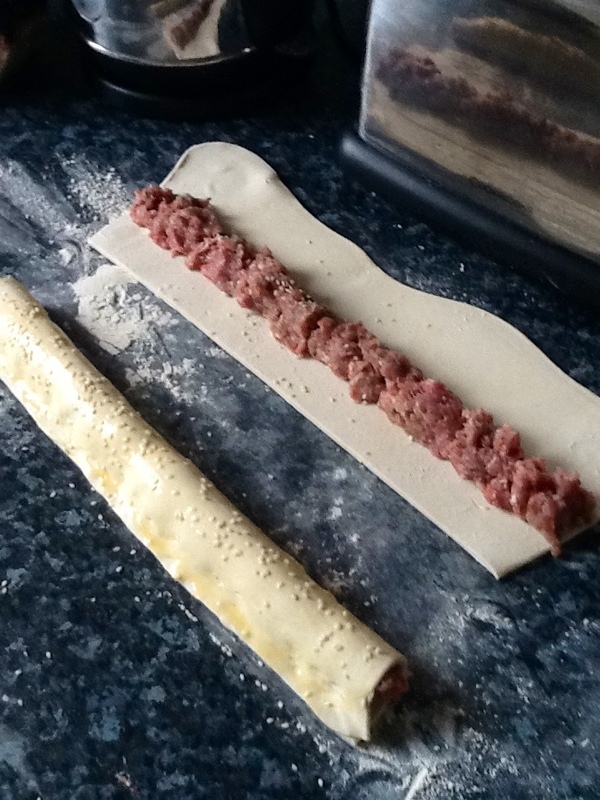 Then I placed it in three rows onto puff pastry which I had rolled out into about a 12″ by 10″ rectangle. I cut the pastry into three sections, folded it over, crimped with a fork, egg washed and sprinkled with sesame seeds. Then I cut them into pieces and baked at 200°F for about 15 minutes until golden. As expected, they were consumed pretty quickly and they were equally as tasty and moist as other versions I have made, plus they didn’t have all the chemical additives which are running riot in our sausage meat! Although, with the current state of affairs, I can’t promise they didn’t contain any horse. Thanks, it really did work really well. You need to try it! Plus turkey’s so versatile you can make it taste like anything you want!